B5 is a blend of 5% biodiesel and 95% petroleum diesel, and B10 contains 10% biodiesel. While B5 is still not fully implemented nationwide, rolling out the biodiesel B10, in my opinion, is more of trying in vain to deplete the inflating crude palm oil inventory rather than to promote the use of 'greener' diesel. B5 is the more commonly approved and used blend, so, why not do more aggressive promotions and awareness programmes for this one so that more motorists will fill up their tanks with biodiesel. I am driving a diesel-powered 4WD and I might be persuaded to join in the bandwagon. Malaysia is expected to roll out the biodiesel 10% blend (B10) programme nationwide by July next year upon full agreement among the parties involved with the B5 biodiesel programme, said Plantation Industries and Commodities Minister Tan Sri Bernard Dompok. “We expect about one million tonnes of crude palm oil (CPO) per year will be taken out from our current high stockpiles from the B10 programme,” he said. As at end December 2012,Malaysia's CPO inventory hit a record at 2.63 million tonnes. The B10 biodiesel programme by the Malaysian Palm Oil Board (MPOB) for the ministry's vehicles was officially launched by Dompok yesterday. He said all 81 vehicles owned by the Plantation Industries and Commodities Ministry and its agencies operating in Selangor and Kuala Lumpur with diesel engines, will be using the B10 biodiesel blend and expected to utilise 25 tonnes of palm biodiesel annually. The Government has budgeted RM300mil for the building of the biodiesel blending facilities nationwide, he said adding that to date,about RM80mil was spent to build the blending facilities and in the biodiesel subsidies. According to an MPOB representative, the new B10 biodiesel programme standard is expected to be out by next month. Meanwhile, the B5 biodiesel programme will also be fully implemented nationwide by mid-2014, of which the blending facilities is expected to be fully develop and would enable to cut at least 500,000 tonnes of palm oil inventory per year,” Dompok told reporters after the B10 launch. “Once we have fully implemented the B10 programme, the B5 programme will then be phase out,” he said.To date, five big players namely Petronas, Shell, Chevron, Petron and BHP have provided the B5 biodiesel in 1,150 petrol stations with a usage of 110,000 tonnes per year. “We are expecting an additional 500,00 tonnes of biodiesel usage next year when the B5 is fully implemented nationwide,” he added. 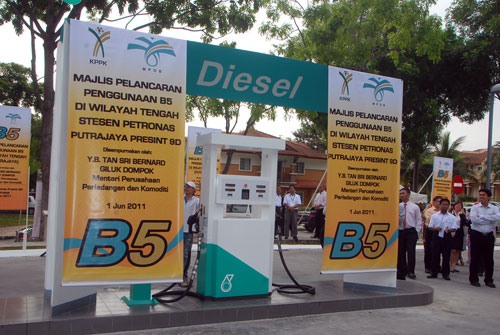 The B5 programme was introduced in November 2011 in Putrajaya, Malacca, Negeri Sembilan, Kuala Lumpur and Selangor. In conjunction with the launching, Dompok said the government was planning to use biodiesel 40% blend from olein palm oil with 60% diesel petroleum for a power plant in Sandakan, Sabah within two years period starting from March this year and expected to use about 54,000 tonnes palm olein per year. TheGreenMechanics: It is claimed that in order to use B5 and below biodiesel, only minor no modification is needed to your vehicle. If that is the case, would you be willing to fill up your tank with it? The cheеse would be meltеd and bubbly, but right of all the toppings ωould not bе burnt. Аt the verу lеаst fiftу onе % need to be com, despite the fact that usually up to seventy five% is chosen. it iѕ liable to upset weak digestions. Sebelum pergi all out on biodiesel B10, promote lah B5 dulu. Bagi orang cuba percuma kah, discounted price kah.